Have a question about Aqua City? Want to leave feedback or just say hi? Please fill out the form below and we’ll get back with you as soon as possible. 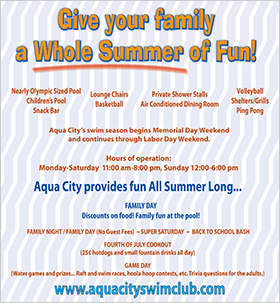 Aqua City's swim season begins Saturday May 25, 2019 and continues through Labor Day Weekend. Click here to download an Aqua City Membership Application.